Anastacia McCleskey, Anthony Wayne, and Jacqueline B. Arnold in Mighty Real. BOTTOM LINE: A ridiculously gifted cast brings the late Sylvester back to life in this wildly entertaining tribute to a pioneer of disco. Right off the bat, I want to make a confession: I love disco. I love it without irony. 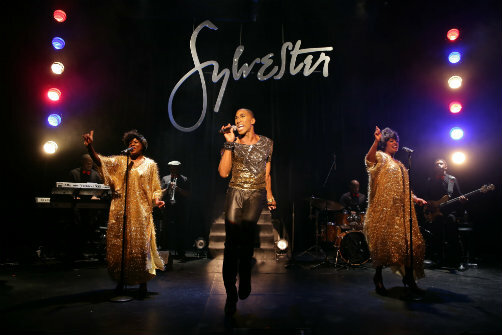 So when I heard that a show based on the life and music of disco star Sylvester was coming to New York, I flipped. Mighty Real: A Fabulous Sylvester Musical seems like an entertainment that was tailor-made for someone like me—someone, that is, who really, really wishes she had been old enough to go to Studio 54 in its heyday. However, the show’s band is so hot, its singers so fierce, and its source material so friggin’ funky that even folks who don’t think of themselves as disco fans will be grooving in their seats. Before Saturday Night Fever came out and the Bee Gees became the face of disco, its adherents were largely people of color, especially black gay men. One of the first stars to emerge from this early scene was Sylvester, whose penchant for sequins, turbans, and chunky jewelry had him disrupting gender norms way before RuPaul. Sylvester also had an insane vocal range that hit high notes even Aretha Franklin might have envied. His best known songs include “Do You Wanna Funk” and “You Make Me Feel (Mighty Real),” but he also recorded soulful ballads like “You Are My Friend” and “Could It Be Magic.” With his backup group, Two Tons of Fun (who would later become the Weather Girls), he blazed a trail through the musical landscape of the ‘70s and ‘80s before dying, like so many of his generation, of AIDS. Mighty Real is light on plot and set but heavy on style and passion. It’s clearly a labor of love on the part of the creative team, and who can blame them? Sylvester was a one-of-a-kind character with a tremendous talent. Happily for us, a Broadway-caliber cast has been enlisted to celebrate his music and legacy and they do him proud. Do you wanna funk? Yes, you do.